Nani moon Meadery is currently the only meadery located in Hawaii. Making use of the local island agriculture, the flavor profiles available here are going to be quite distinct from anything you can find anywhere else in the world. Ohia ‘ai (also known as mountain apples). The nose on this mead has a quite strong honey character to it, with a subtle floral hint to it. The flavor is extremely floral up front, with a subdued apple flavor mixed in. It’s on the drier side of semi-sweet, but has enough body to still cling to the glass pretty well. On top of all that, it’s a sparkling mead, giving it a lively and rich mouthfeel. Overall, I really enjoyed this mead. I would definitely recommend giving it a try, if you have the opportunity. It is not likely something you’ll find anywhere else. I was recently able to visit Western New York’s “First and Finest” Meadery, 810 Meadworks. It is located between Buffalo and Rochester, in a small town called Medina. It is a cozy little building with a bar and a few small tables. But don’t let the venue’s small size fool you, they have a huge drink menu. They sell reasonably priced tasters in sets of 3, but even then it took a fair amount of sharing among the group I visited with to try most of their 20 or so varieties they had available. Even more impressive, was that even with this huge assortment, there weren’t any real slackers in the lineup. They were all pretty good. And some were exceptional. 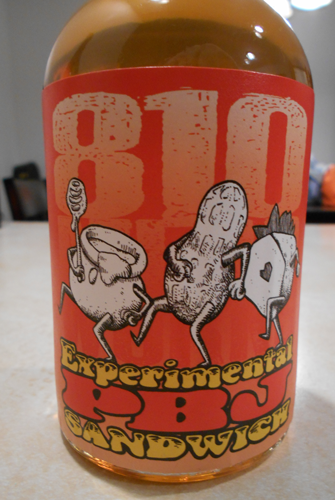 When I was there, 810 had an experimental PBJ Sandwhich batch as their featured mead. This was a limited release, but I’m hoping it sees enough popularity that they keep it around. It was my favorite of the bunch, and I actually got a bottle of it to take with me. Unlike another PBJ flavored mead I’ve had, the peanuts were really prominent. Carbonated, saison-style, with lemon, peppercorns, and Soarchi Ace hops. 7% abv. Carbonated, IPA-style, with Cascade, Simcoe, and Nugget hops. 7% abv. This was a light and refreshing drink. Very crisp with a citrus nose. It did not have a very strong flavor profile, but that made it easy to drink. Was slightly sparkling. Wildflower honey with elderberry. 13% abv. Alfalfa honey with pears. 13% abv. Another lightly flavored drink. The alfalfa honey is much more prominent than the pear flavoring, which comes through a little in the finish. Has a sweet scent. This was my least favorite of the lot, actually. It was interesting, as I had yet to experience an alfalfa honey before, but it had a touch of harshness to the aftertaste. I’m curious what this would be like as a sweeter mead. Pear is a very delicate flavor that I’m not sure comes through well in drier drinks. Carbonated, blueberry honey with apples and cranberries. 8% abv. This drink had a nice, tart berry flavor to it. The nose is definitively apple, though, and is quite strong. Taking that first sip come as a bit of a surprise with that deceptive scent. Overall, a nice drink. Carbonated, light amber honey with lemons, lavender, and green tea. 8% abv. This mead had a very strong lemon nose to it. It had a nice acidity and combined with the carbonation, gives you that mouth-watering sensation. Carbonated, mesquite honey with ginger. 8% abv. Very strong ginger scent. Has a bit of that ginger bite to it. Straight forward, but enjoyable flavor. 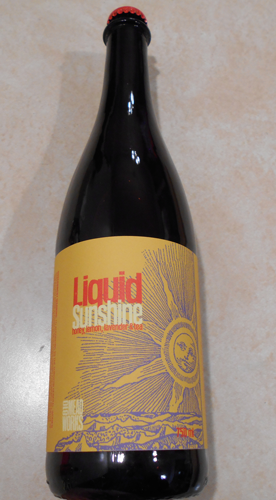 This one is a collaboration brew with Leonard Oakes Estate Winery. Blueberry and wildflower honey and a blend of heritage apples. 8% abv. This has a strong apple nose and flavor. Very cider-esque. Has a good blend of that crisp, slightly tart apple flavor and sweetness. Scorched buckwheat and clover honey aged in bourbon barrels. 10% abv. This one was very interesting. It had a rich, dark coloring. The bourbon and oak notes come through nicely, adding a complexity to the mead. A bottle of this was purchased by the group. Clover and buckwheat honey with vanilla beans and coffee beans. 11% abv. Alfalfa honey with agave, oranges, and limes. 12% abv. This was a margarita inspired mead. Very strong sweet citric nose. Had a nice mouthwatering acidity to it. This was one of my girlfriend’s favorites and we ended up with a bottle of this as well. Carbonated, orange-blossom honey with vanilla beans and lactose. 8% abv. This was another of my favorites. A delightful orangey scent. The actual orange flavor is somewhat subtle, coming in at the end. The lactose gives it a very smooth texture, and it is very easy to drink. A nice amount of sweetness to it. Everything you’d expect from a creamsicle. Light amber honey with mint, chocolate, and lactose. 8% abv. This mead smells just like an Andes Mint, and is very reminiscent of the grasshopper cocktail. 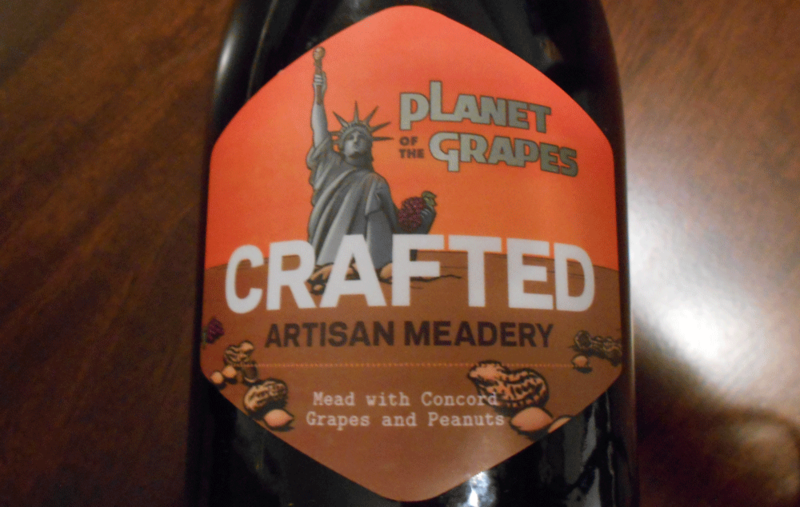 It is another very smooth, creamy textured mead and is very easy to drink. The mint flavor itself is subtle, and not overpowering. It’s fun, it’s sweet. Try it, you’ll enjoy the experience. Clover honey with maple syrup, vanilla, cinnamon, and nutmeg. 11% abv. Sweet scent. Very mapley. This is a very thick mead, meaning it’s fairly sweet. The spices add a nice bit of complexity to it so it doesn’t taste like straight syrup. This was another of the group’s favorites. Orange-blossom honey with Assam black tea and fresh oranges. 13% abv. Wildflower honey with black currants, black tea, rose petals and oil of bergamot. 13% abv. This was very reminiscent of a port wine. It has a pleasant floral nose, and a deep purple coloring. It is sweet, with a bit of a tart finish. It has a nice body to it, as well as a mouthwatering acidity. Mixed-berry honey infused with fresh strawberries. 14% abv. Clover honey with Riesling grapes and peaches. 14% abv. Very similar to a Riesling wine, although a bit sweeter than you might expect one of those to be. The peach is very subtle, almost entirely in the aftertaste. Not much of a nose on it at all, but is easy to drink. Small batch of the Maple tap aged in a local bourbon barrel. 12% abv. 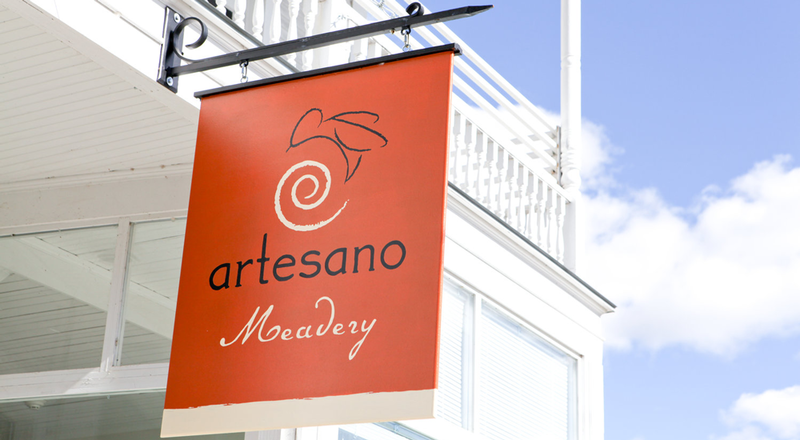 Artesano is a Vermont meadery, located in Groton. They also produce vinegar tonic and ice cream, and are known for their small handmade batches using local, natural ingredients. This is a sweet mead that is balanced out by the strong kick of heat that the chili pepper contributes. At 12.9% ABV, it carries a fairly strong kick as well. The heat is very prevalent, but not overpowering. The cinnamon comes in at the end to provide some complexity. The flavors are very balanced. It is quite a thick liquid, and has a decently high alcohol content making it more of a sipping drink than something to session. Golden yellow in color, it has a strong spicy pepper nose with a hint of the cinnamon peeking through. Like many other spicy drinks, this may not appeal to everyone. Crafted Artisan Meadery is located in Mogadore, Ohio. If you’re not lucky enough to live near their tasting room, they do distribute to several states, and even have an online Mead club that will ship you a selection of their wares quarterly. As a peanut butter and jelly flavored mead, this was rather unique. A sparkling mead; the effervescence made for a light and sweet experience. It has a strong, but pleasant grape nose. The color is a very deep, rich red with the slightest hint of purple to it. Given its dark red color, you might expect this to be a dry mead, as a grape wine might present itself. However, this was quite sweet. But the carbonation and the acidity balance it nicely so it isn’t overwhelming. It has a very faint trace of peanut flavor in the finish, giving it that familiar pb&j experience. Not knowing ahead of time that peanut was in this drink, you might not be able to place it. Including any kind of nut flavoring in a drink is a pretty tall order as the oil doesn’t mix well, and that is where most of the flavor is located. Overall, this was a very pleasant drink, and something that you’ll remember experiencing. This meadery has been on my radar for a while, and I finally was able to pay a visit this weekend. Wild Blossom Meadery and Winery is located in Chicago, and is a convenient couple minute walk from the Red Line train stop at Beverly Hills. I was quite impressed with this meadery. It has an absolutely huge variety of flavors available. My girlfriend and I each got a flight of 6 varieties, and there was still enough left on the menu for nearly 3 more flights’ worth. The majority of their menu was mead, but they additionally offer a few different wine varieties as well. 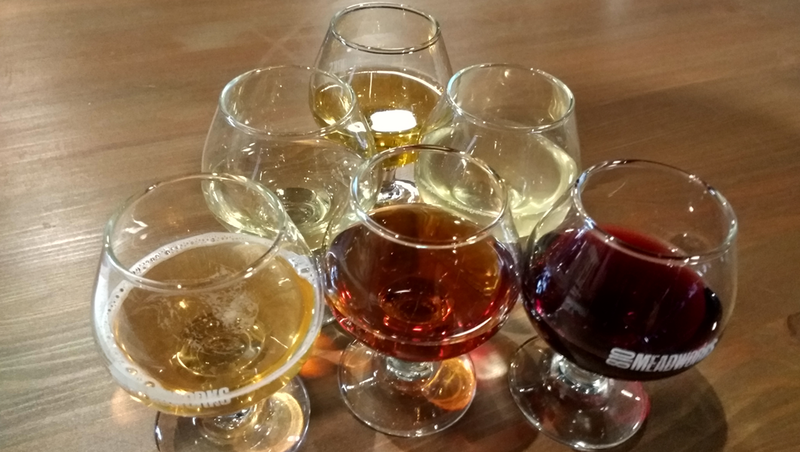 On top of the main flavors, they also have a few suggested hybrid mixtures of what they have on tap (half of one and half of another), as well as several mead-based cocktails. If you’re ever in the area, I definitely recommend checking them out. 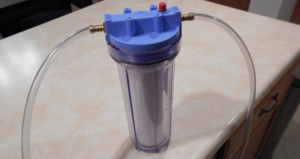 I have also found some of their products in beverage stores around Illinois, and they also sell from their website at http://www.wildblossommeadery.com/. They offer flights, glasses, bottles, and growlers. Prairie Passion – This is their traditional mead. Light and sweet. Nice honey flavor. Raspberry Peach Nectar – This was my least favorite of the bunch. Peach is a tough flavor to get to come across right. I found this one to be a bit astringent on the back end. The hint of raspberry tamed that a bit. Blueberry with Coriander & Cardamom – This was one of my favorites. It has a strong floral nose, with a strong hint of the spices it contains. The berry flavor hits your first, but the spices quickly catch up. Instead of being completely distinct flavors, the fruit and spices blend very well in this drink, complimenting each other. It was quite refreshing. Chocolate Honey Buzz – I was surprised by this one. It’s appearance is very unassuming for something with chocolate in its name. It’s a pale yellow color. However, you can immediately smell the chocolate when you go to take a drink. It’s a slow build with the flavor as well, you get that honey taste up front, and slowly the flavor of chocolate builds. It was a sweet, full chocolate flavor, much unlike a lot of cocoa infused drinks that have that bitter bite to them. I really enjoyed this one. 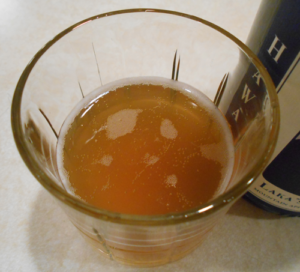 Lemon Ginger – A sparkling mead. This was a refreshing drink.Light, lemony, sweet, with that gingery spice at the end. Wolfcraft – Another sparkling mead. This was blood orange featuring Mandarina and Amarillo hops. We both really enjoyed this one, and actually got a growler to bring back. The hops were there more for their flavor than that bitter bite. I’m not much for very hoppy drinks, but this one was very nice, and it melded with the rest of the drink, instead of being an overpowering presence. It was quite refreshing, and had a light fruitiness to it. It was very flavorful, though. Combined with the effervescence, a sip caused your whole mouth to feel involved – lighting up all the taste buds. Hibiscus – This was a newer flavor they just put on the taps, and wasn’t on the menu at the time of my visit. Very strong floral nose. Hibiscus Lime – This was similar to the above, but had a refreshing lime note to it. Halcyon – This was a mixture of several types of berries, I believe cherry and raspberry were among them. It had a floral nose, and a very berry flavor. Kind of like a fruit punch or kool-aid, so this is a good one for those who prefer a less prominent alcoholic flavor. 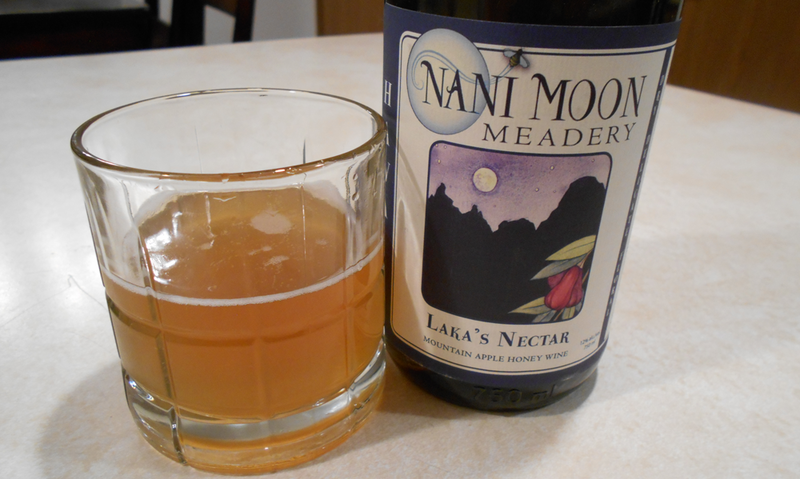 Cherry Nectar – This had a very nice, sweet cherry flavor. A light touch of cherry on the nose that doesn’t reveal how full the flavor actually is. It had a medium body. Sweet Desire – Traditional with Buckwheat honey, aged in a bourbon barrel. This had a very strong bourbon scent to the nose. It was fairly sweet, with a rather thick body. I got a nice caramel flavor on the back end. This had a real complexity to it, and the flavors seemed to morph and shift into each other even after you’ve swallowed. 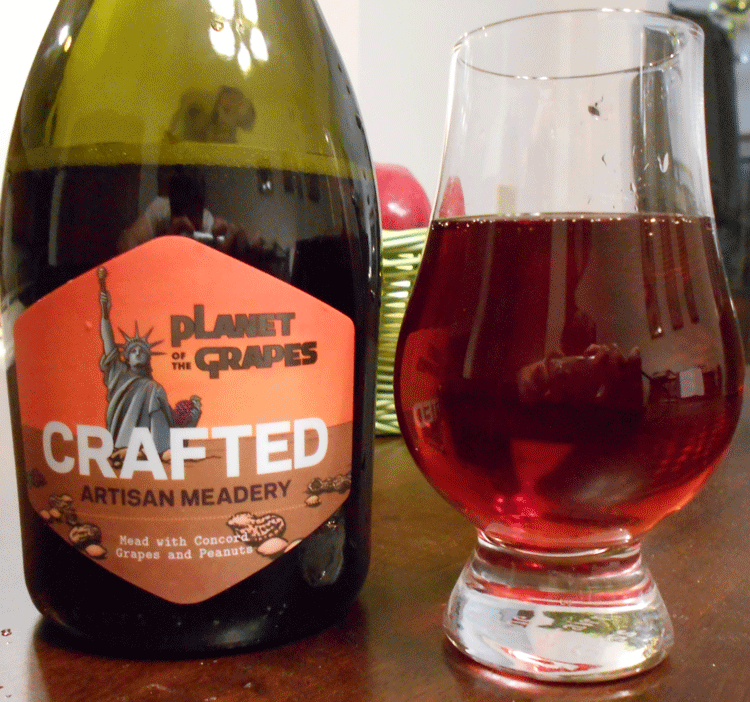 Blueberry Pomegranate – This was another sparkling mead. It had a nice, light, refreshing flavor to it. A pleasant mix of fruits, and was one of the more carbonated of the sparkling meads on tap. Pirate’s Blood – Mead infused with 3 chili peppers (if you purchase a bottle, they’re still soaking in it). This has quite a bit of heat to it. It’s a nice, thick mead, and is fairly sweet. If you do try this one, definitely do so last, it will cover up pretty much anything you drink after it. It was very good, though. And comes in a cool skull-shaped bottle. B. Nektar Meadery has released a “Extra Limited” batch of their traditional mead that has been aged for 2 years in Bourbon Barrels. B. Nektar labels generally have some pop culture theme to them, and this one has gone for a Star Wars motif. This mead weighs in at 16.2% ABV, which should be a good time. Right off the bat, you can smell the bourbon and oak. The nose on it is quite strong, but has some slight hints of sweetness that are detectable. I really enjoyed this one. It is pretty far on the sweet scale, which gives it a very thick mouthfeel to it. You can even see this by the legs of the mead sticking to the sides of the glass. You get a nice, simple honey flavor upfront. The aging has given this a distinct, but pleasant bourbon flavor on the backend. This helps to keep the sweetness from being to cloying. Somewhere in the middle, there is a sense of heat, likely from the bourbon or oak. There’s a nice amount of acidity that creates a mouthwatering, refreshing sensation to the drink. Given its limited run, make sure to pick this up if you can. May the pours B. with you.